Welcoming educators into our classrooms to observe and having our teachers visit other schools to do the same is a common occurrence at BVP. We believe that to truly improve upon our educational landscape we must prioritize collaboration and the sharing of best practices. A few weeks ago our Network Art Director and Middle School 1 Art Teacher Michelle Turner welcomed another teacher into her classroom. 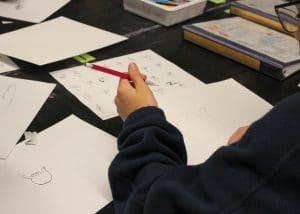 After meeting at the RI Art Association Conference, Dana Janik, the art teacher at the Rhode Island School for the Deaf (RISD), and Michelle connected and the invitation to observe the choice-based art model we use at Blackstone Valley Prep (BVP) was extended. 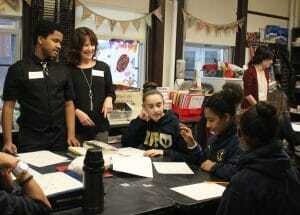 As Michelle and Dana debriefed their visit, an idea was sparked to bring the students at our two schools together and a new opportunity was born. 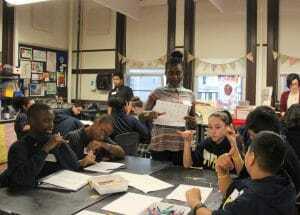 High school seniors at RISD would be offered the opportunity to teach an art lesson to 7th grade scholars at BVP. For the seniors and 7th graders it would provide the opportunity to use art as common ground in a situation where communication would be challenging. At BVP, we speak to our scholars often about “communicating across lines of difference” as well as about respecting and empathizing with the perspective of others. This collaboration would challenge our scholars to communicate across a line of difference and empathize with a situation that many of them had never considered before – being unable to use the spoken word. After a tour is finished or when a classroom visit is completed, there’s usually one question left – the million dollar question – How do all of these pieces come together to help fulfill your mission to prepare scholars for the world beyond? Our answer: collaborations like this. Situations where we can bring lessons to life and allow our scholars to try their hand at applying what they have learned. The world is a complex place, so whether it be through a history lesson or through art we are going to take every opportunity to prepare them for it. A special thank you to the staff and students at the Rhode Island School for the Deaf. We can’t wait to work with you again! Take a look below for some photos from our collaboration.